Dwight Hall will have an open house from 2-4 this afternoon (4/13) in the Library, so stop by if you want a real-life version of Dwight Hall Match or just feel like chatting about social justice. 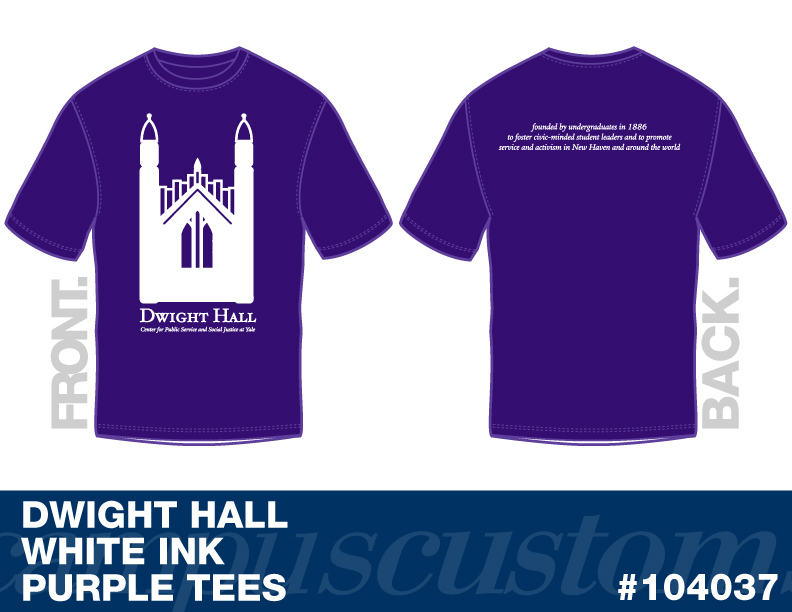 I'll be passing out flyers to prefrosh in my�brand new Dwight Hall t-shirt�(click here�to order one!). Our main Bulldog Days event will be a�panel in the Common Room�from 5-6 on Thursday. Definitely come by - the questions and conversation should be of general interest to all. Outdoor Service Day & Bulldog Days! 2.�BULLDOG DAYS�is coming up! Next week's D-Holla will come out on Tuesday with a�list of Dwight Hall-themed events for prefrosh, which will also be distributed to prefrosh as they come into Dwight Hall for the first time to pick up their registration packets. �If your member group is hosting an event,�please let me know�so I can add it to this list�by filling out this form. Speaking of which, the D-Holla will be moving to a more consistent release day. Please get your submissions to me or post them on the website by Tuesday at noon, for a Tuesday afternoon release! Kickoff to Public Health Week! April 1 marks the beginning of�Public Health week. Over the next 10 days, campus will be filled with talks, luncheons, films, service opportunities, and more to spread awareness of public health matters. Don't miss the�kick-off concert�this Friday at 7 in Dwight Hall! Meanwhile, there are still other events going on. TODAY, there's a conversation in the Law School with�John Prendergast�about the future of Sudan, a conversation about�sustainable seafood�with Barton Seaver, and some awesome films & discussions as part of theEnvironmental Film Festival. There's a luncheon tomorrow on�starting your own non-profitwith Pathways for Mutual Respect. Saturday marks the�Human Rights in Academia Conference�as well as the�Powderpuff tournament. Don't forget to submit your�"Impact: Global Poverty"�proposals, or register to participate in�FOCUS! Feel free to email me with your questions and events! Welcome back! I hope you've returned from break feeling refreshed and ready to jump into the spring cycle of social justice at Yale! In other news, sign ups for the�YHHAP Fast�are currently going on - the Fast itself will take place on April 8. There's a�Harry Potter Trivia Night�fundraiser sponsored by Nourish International and a fantastic seminar on how to write op-eds this Friday.�Impact: Global Poverty�is looking for proposals, and FOCUS wants both participants and leaders. And there are still a few�summer opportunities�floating around! Before you depart for your various reach out trips/a cappella tours/weeks of eating home-cooked food, be sure to check out the events coming up in the next few weeks. This week's D-Holla features a lot of ways to get involved with Dwight Hall as an institution, as well as some things to start thinking about that come up right after break (YHHAP Fast, anyone?). First, the Loving Kindness Fund is up and running! As a reminder, the Loving Kindness Fund serves�to enable Dwight Hall member groups and individual Dwight Hall volunteers to engage in small-scale outings with project participants and enhance existing Dwight Hall projects through small acts of kindness. Applications (available here) are accepted on a rolling basis through 4/1/11. Talk to our financial coordinator, Aaron Feuer, for details! Second, Cabinet Meeting is coming up! The semesterly Student Cabinet Meeting, which will occur at�7pm on Tuesday, March 22�in the Dwight Hall Common Room, is one of two opportunities each year for the leaders of member groups to come together to exercise their power as voting members. Excomm will also use this opportunity to inform you about some recent developments in our efforts to better support member groups. This meeting is mandatory for all Dwight Hall Member Groups, so see you there! Have a wonderful, restful break, and I'll see you in the spring! TONS of Events in the next few days - to further distract you from studying. --�College Council for Care�somehow booked Nicholas Kristoff for April 5. They're showing a screening of "Reporter," the documentary featuring him, tonight at 7:00. --If you don't like Kristoff or prefer earthier stuff, there's a screening of�Symphony of the Soil�in WHC at the same time, with director Deborah Koons Garcia holding a Q&A. --Habitat for Humanity�is having another build this Saturday - and the weather is going to be (relatively) awesome. --Hips for Hunger! Belly dancing for a good cause on Saturday night! --This Friday, YHHAP is holding a benefit concert at 8:00 with�Shades, OOTB, and TUIB, all for $5. I'll definitely be there. There's a couple of things to take note of this week. The Reblaw & Human Rights in Academia Conferences are coming up - sign up links are below. You have a couple of chances to do some quick advocacy work by discussing antiwar strategy at the People's Center or by picketing with the New Haven Worker's Association. Remember to submit your own advocacy actions toAdvocacy Minute! The Public Health Film Festival and Global Health Incubator Workshop are coming up soon in March. There are still a few summer & spring break options - check out Spring Break in New Haven, and applications for Harvest leaders are due by Friday. �If you're looking for a moment�of service this week, be sure to join Habitat for Humanity in a build this Saturday! Finally, be sure to take the Magee Fellows up on their offer for lunch - they're wonderful folks who know a lot about Dwight Hall. Summer opportunities are still making an appearance for a while, but this week is full of events in itself! Don't miss one of the many info sessions about volunteer opportunities in New Haven and abroad (see the ones for City Fellows & Breakthrough National Teaching Internship). If you're so inclined, the International Development & Gift Bazaar, Habitat for Humanity, and Yale Rotaract offer plenty of ways to prepare for Valentine's Day. And mark your calendar for the Rock to Rock Earth Day kick-off party at Koffee?, or the tea with the director of Seeds of Peace! Don't Miss Out on Summer Deadlines or Awesome On-Campus Events! This week's D-Holla features a few more�summer & spring break opportunites. Don't hold off on reading through them - the deadlines for most fall�this weekend! If you're looking for something a bit sooner, check out our�Service Opportunities�column! You can give blood for the Red Cross Harvard-Yale Blood Drive Challenge, volunteer with YHHAP for Abraham's Tent Week, or check out some very relevant panels, discussions, and films in youth activism and human rights. Both Dwight Hall member groups (see Starlabs & Yale Children's Theater) and community non-profits (see Neighborhood Housing Services or AIDS Project New Haven) are�searching for Yale volunteers, so get yourselves out there! Enjoy the wintry mix while it lasts! Seeking Summer Plans? Look No Further. This week's newsletter brings you service opportunities galore - during the semester in New Haven, and over the summer around the world. This summer theme will continue next week - submit your event if you'd like it to be posted in the D-Holla next Wednesday! The most direct way to gain access to the Dwight Hall member groups is by coming the�Spring Bazaar�this�Wednesday, 1/19. Our 85+ groups will have representatives and information available for anyone seeking a service project. Finally, be on the lookout for summer opportunities as they pop up! 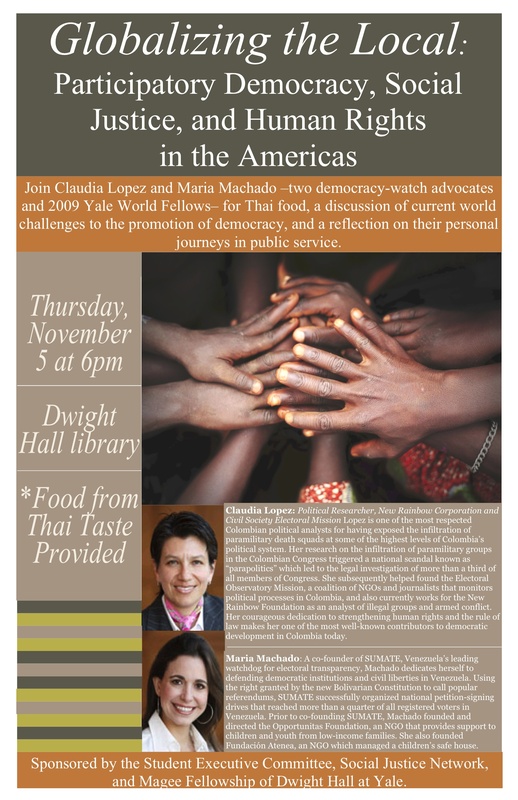 The D-Holla will be publicizing service- or social justice-related opportunities. If you have one to submit, feel free to email me! Thanks for your input, and see you all at the bazaar! Yale University students have arrived back in New Haven for the Spring 2011 semester. 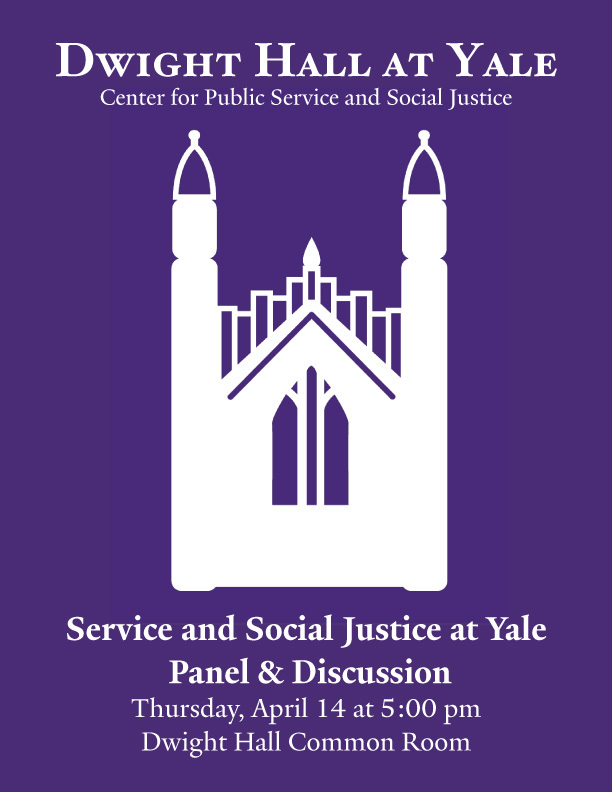 Dwight Hall currently engages 3,500 undergraduates (or nearly 2/3 of Yale College) in service and justice activities each year. Help us expand our participation - host a group of volunteers during the MLK Day of Service or recruit students at our Bazaar for Service and Advocacy. As always, please feel free to utilize the Dwight Hall website to post announcements for events or for general volunteer opportunities throughout the semester. Best wishes for a happy, peaceful, and successful 2011! Hope that your reading weeks are going well! We have some phenomenal events in this last week, many of which are TODAY so please check them out! 1.��� Habitat for Humanity Gingerbread House Decorating Fundraiser TODAY! 2.��� Before you leave, donate your extra clothes to the No Freeze Clothing Drive! 3.��� Dont throw away that textbook! Donate it to the Book Exchange! But if youd rather think about warm weather and spring or summer breaks, we already have some spring/summer opportunities listed below. Peru! Bosnia! New Haven! I can personally vouch for the Spring Break in New Haven program its the best way to get to know your city! This is the last D-Holla of the semester! Thank you to those of you who have submitted events, looked through this newsletter, and to those of you who replied every once in a while (looking at you Marina Keegan and Diana Saverin). I hope that it has been helpful! If you ever have a question about service or social justice at Yale or in New Haven, please dont hesitate to D-HOLLA AT YOUR BOY. Hope you all had restful and productive Thanksgiving breaks, because weve got a lot for you to do this week! Please see below for all the information about AIDS Week, the Alternative Gift Market, the Bone Marrow Dive and ongoing Clothing Drive. There are also two very exciting new opportunities from the Yale Hunger and Homelessness Action Project. 1. You can be a part of the first effort of Yale students to house the homeless. 2. You can help provide maximum tax refunds to low-income New Haven families. See below for more information about both opportunities! Id also like to make a final pitch for the New Haven Tree Lighting Celebration which will be tomorrow, Thursday December 2, from 4:00 8:00PM on the New Haven Green. A jem of the city, this holiday event is always filled with cheer! This is not a service event, but a time to join in celebration with the community we serve. Santa will be there, and so will I! There will be one more issue of the D-Holla before Winter Break so if you have any events occurring near the end of reading week or during finals week, please let me know! Just a quick note to encourage you to look at the events and opportunities below. You can support the IVAWA and the DREAM Act by stopping by the women's center at some point from 1-4pm today to make a call to a legislator. There's a clothing drive starting today, so instead of dumping your clothes before Thanksgiving, bring them to a blue bin placed in your college! New Haven Community Services Agency is hosting a Tent City community event out on the Green tomorrow night from 6:00-10:00pm to raise money for women and children shelters. There will be Yale bands performing, check it out! Finally, there are some good summer internship opportunities below - Peru?, Public Health? You choose! Thank you to those of you who came out to the Cabinet meeting last night! We voted in three new member groups: Bookmarks, Fierce Advocates and Musical Cure. Until next semester the 2010 ExComm will still be working hard for you, so please continue to give us feedback. Also, check out some of the opportunities below - especially some of the great social justice talks this week! Cabinet will vote to elect a new Executive Committee on Monday, November 9 at 7 pm, to serve for the 2011 calendar year. Any sophomore or junior who has been an active member of a Dwight Hall group for at least one semester may run for a position. Executive Committee positions that will be elected at the cabinet meeting: Co-coordinators, Public Relations, Financial, Membership, New Membership, Institutional Service and At-large. FAST, Funding App and Office Hours! The YHHAP Shelter Now Campaign for the New Haven family shelters is in full swing with the YHHAP FAST on Thursday, October 21st and Family Weekend Professor Lunches! Today is the last day you can sign up for the FAST - please do so! Also, this Tuesday the Dwight Hall Program Director Johnny Scafidi will be holding office hours from 2:30 - 4:00 in the Dwight Hall office. 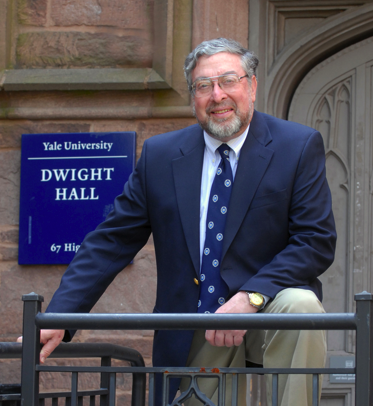 If you have any questions about Dwight Hall resources, if you're looking for community contacts or if you want to be more involved in community service at Yale, but are not sure where to begin - Johnny Scafidi can help! I'd also like to highlight the event happening today: "Freedom from Fear, Freedom from Want: What's Next for the Human Rights Movement?" A Master's Tea with Larry Cox, the Executive Director of Amnesty International. Today, 4pm in the Saybrook Master's House. As always, if you have any questions about Dwight Hall - let me know! The YHHAP Shelter Now Campaign is kicking-off in 3 days at the Sleepout on Saturday and will continue with a series of events including the YHHAP FAST on Thursday, October 21st, Family Weekend Professor Lunches and more! Shelter Now is a fundraising campaign of the Yale Hunger and Homelessness Action Project, supporting winter shelters in New Haven. The campaign began in October 2008, when the Cedar St. Overflow Shelter was almost entirely cut from the City budget. Its closure would have forced up to 125 men into freezing temperatures on the streets of our city. Over the next two months, Shelter Now worked with advocates and non-profits throughout the New Haven area, and successfully kept the shelter open. Because the budget crisis continues in New Haven, the Shelter Now campaign continues as well. This year, YHHAP hopes to raise $25,000 to alleviate severe cuts to women's and children's shelters: Life Haven and New Haven Home Recovery. Please consider showing your support at one of YHHAPs upcoming events. See below for more information! Also, TONIGHT Blue State Coffee is hosting an event with a bunch of neat New Haven non-profits. You can stop by for free coffee, cupcakes and community service! Advocacy Minute and Shelter Now! First I'd like to call your attention to the new Dwight Hall newsletter: Advocacy Minute! "Advocacy Minute is a biweekly email newsletter and blog with quick, easy action items generated by Yale students and student groups. Action options include, but are not limited to, writing a letter, signing a petition, attending a rally, and making a phone call. Advocacy Minute a way for Yale students who want to bring about social change to support each others work. It allows students to draw broad support for their issue of interest while, in turn, supporting issues of interest to others." Please also be aware that the YHHAP Shelter Now Campaign is kicking-off in 10 days at the Sleepout and will continue with a series of events including the YHHAP FAST, Family Weekend Professor Lunches and more! Kevin Salwen is the author of The Power of Half and will discuss his family's decision to sell their house and give half the sales price to charity. Kevin was a reporter, columnist and editor at the Wall Street Journal from 1981 to 2000. At the nations largest newspaper, Kevin helped cover two presidential administrations, wrote two columns and launched two publications. Since leaving the paper in 2000, Kevin built several media ventures and works with such organizations as the U.S. Olympic Committee and Yahoo! A graduate of Northwestern University, Kevin serves on the boards of Habitat for Humanity in Atlanta and the East Africa Childrens Education Fund. In 2006, at the urging of his then 14-year-old daughter Hannah, Kevin and his family embarked on a family philanthropic project to help villagers in Africa build a better future for themselves and their children. As always, if you have any questions about Dwight Hall, any one of our three networks, 85+ member groups or institutional programs, please ask me! Also, Wednesday mornings are now a D-Holla�tradition! So if you'd like to include your own content in the D-Holla, please get it to me by Tuesday night. It was an exciting weekend at Dwight Hall as hundreds of freshmen participated in the Freshman Day of Service on Saturday. It was a beautiful day for cleaning up parks, gardening at the health clinic, building bikes and more! This week, we have the Dwight Hall Bazaar! Wednesday, September 15th. 7:00 - 9:00pm. Dwight Hall. Come to hear from and sign up for some of our 85+ member groups and institutional programs. There will be groups at the Dwight Hall Bazaar that were not at the Yale activities Bazaar, so don't miss out! If you're coming to represent a member group, remember to arrive early to set-up! Keep in mind that our Distinguished Mentor, Kevin Salwen event will be Thursday, September 23rd , 4:00pm. Dwight Hall Chapel. Talk with the author of The Power of Half about his familys decision to donate half of their wealth to charity. A note about blurbs for the newsletter (since things for the first few days have been a bit irregular here at D-Holla headquarters): If you get a blurb to me by Wednesday morning, it will go out with the D-Holla that will always be sent on Wednesdays, starting the 22nd of this month. Welcome back to Yale! I hope you all found a way to continue your passion for service and social justice this summer! Additionally, I am here if you have any PR needs. I can help design fliers or take photographs at your event. �Whatever you need, please feel free to ask! Today's newsletter is a very exciting one. Below you will find the first meeting times for many of our member groups. If you are intrigued by a member group listed, but dont know much about it, or if you are just interested in exploring all of the options open to you through Dwight Hall, you can find all the information about our member groups here: http://www.match.dwighthall.org/search.php?seeall=yes. 1. Dwight Hall Bazaar Wednesday, September 15th. 7:00 - 9:00pm. Dwight Hall. Come to hear from and sign up for some of our 85+ member groups and institutional programs. There will be groups at the Dwight Hall Bazaar that were not at the Yale activities Bazaar, so don't miss out! 2. Freshmen Day of ServiceSaturday, September 11th, 10:15am 2:00pm. Dwight Hall. The Freshmen Day of Service is an introduction to service in New Haven. Groups of freshmen, led by upperclassmen with Dwight Hall experience, will volunteer at great New Haven non-profits, making a difference in just a few hours of hands-on work. Along the way, you'll learn about all the opportunities New Haven and Dwight Hall have to offer to serve your community throughout the year. Breakfast and lunch will be provided. 3. Distinguished Mentor Kevin Salwen Thrusday, September 23rd, 4:00pm. Dwight Hall Chapel. Talk with the author of The Power of Half about his familys decision to donate half of their wealth to charity. Finally if you have any questions about Dwight Hall, any one of our three networks, 85+ member groups, institutional programs, or the events above or below, please ask me! This is going to be a great semester! Welcome back! I hope you all recharged your service and social justice batteries because we have some great events coming up in the next few days. Check 'em out! Yale University students have arrived back in New Haven for the Spring 2010 semester. Dwight Hall currently engages 3,500 undergraduates (or nearly 2/3 of Yale College) in service and justice activities each year. Help us expand our participation - host a group of volunteers during the MLK Day of Service, recruit students at our Bazaar for Service and Advocacy, or offer a research opportunity to forge a link between theory and practice. On a somber note Dwight Hall is partnering with students, organizations, and officials at the University to extend support to Haiti. Please see the announcement below regarding a benefit concert on Monday, January 18. I'm Joe Breen, your new Public Relations coordinator. Please always feel free to e-mail me information about an event or opportunity you would like to advertise in the D-Holla or if you have any questions about Dwight Hall! The semester has started and Dwight Hall has hit the ground running! This Monday (1/18) Alpha Phi Alpha is sponsoring the MLK Day of Service - a one-time service event and a great way to spend your free morning helping a community organization! Find more information and sign up here: MLK Day of Service. Also, the Dwight Hall Bazaar will be this Tuesday (1/19) 7-9pm in Dwight Hall. If you are looking to learn more about or join one of our 85+ service and social justice student groups, this is your night to find them all in the same place! See you there! Also please check out spring break and summer opportunities as well as upcoming events below! Merry Christmas and Happy (soon) New Year! Finally, this will be my last D-Holla of the year. Joseph "Joe" Breen will be taking over starting next semester. For future publicity information, please email Joe! And remember, throw some d's on that holla. Hopefully, everyone got stuffed this past week. Its the home stretch now...best of luck on the last exams and finals! If you're looking to buy a gift for a friend or family member for Christmas, be sure to check out the Alternative Gift Market, occurring this Saturday afternoon on Old Campus. The goods come from all over the world and are fair trade certified. And if anyone has a hunkering to figure out what SOM does for philanthropy, be sure to check out this conference that's going on this Friday. As the school year isn't kidding around anymore, info sessions on various ways you can get involved with service and social justice will be held this week and the next. Mentoring also begins very soon. There's MEChA, an organization dealing with immigration rights. There's TAG, a group that teaches seniors and the elderly how to use technology. And for elderly seniors of an entirely different kind, there's a Teach for America info session this week that is just-can't-miss. Also, a shout out to all the people who participated in the Freshmen Day of Service, organized by the Yale College Council and other individuals. It wouldn't have been the same without the volunteers. Well I guess that's obvious but seriously, way to go on waking up at 9 on a Saturday morning and braving gloomy New Haven weather. Finally, the dissappearance of Annie Le is a tragedy and both frightening and worrisome. A vigil will be held this week. For those of you receiving this email for the first time, Dwight Hall is the center and umbrella for community service and social justice at Yale. The D-Holla is the weekly newsletter for Dwight Hall and advertises events and service opportunities. Pretty much everyone that passes through here has volunteered with us (80 percent) and that means you should too. Hopefully, you will find it just as immensely rewarding as most of us. 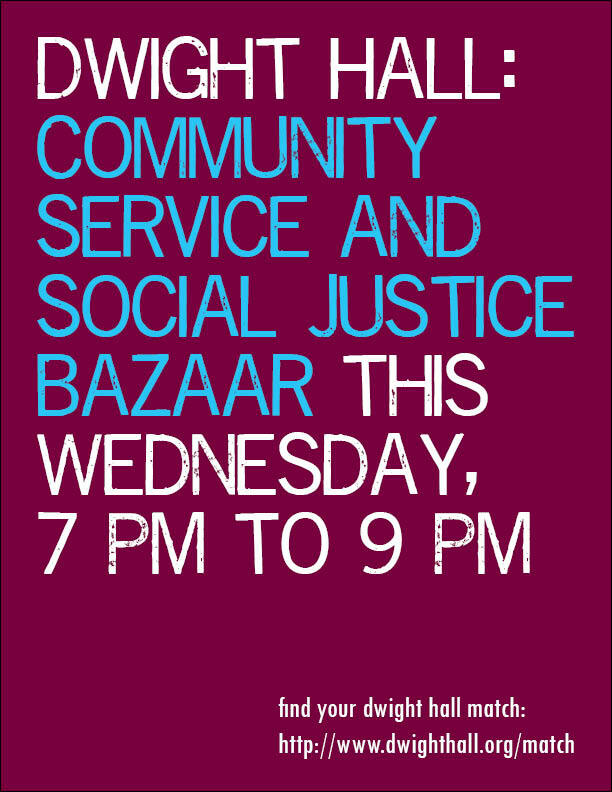 To learn more about Dwight Hall, come to the Dwight Hall Bazaar on Wednesday, September 9 from 7 PM to 9 PM. There, you will see more than forty of our community service or social justice groups and get a chance to see some of the earthshaking, mindbending service and advocacy work that students are doing. More importantly, you'll learn how to get involved. And finally, if you've got the time and are still reading this note, take a peek at this editorial written by an active member of Dwight Hall. That's all for now and remember to throw some d's on that holla. Congratulations to everyone for finishing another school year. I hope everything turned out well. Thanks, also, for the countless hours put towards community service and social justice. For people looking to volunteer over the summer, please take a look at Volunteer Match which matches people with nonprofits no matter where you are. The end is near. 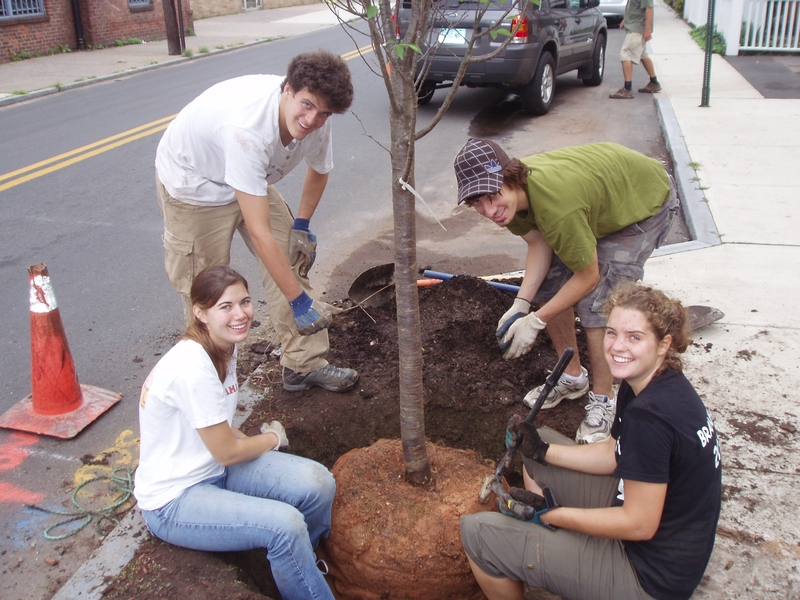 Be sure to check out the summer service projects if you are staying in New Haven this summer. 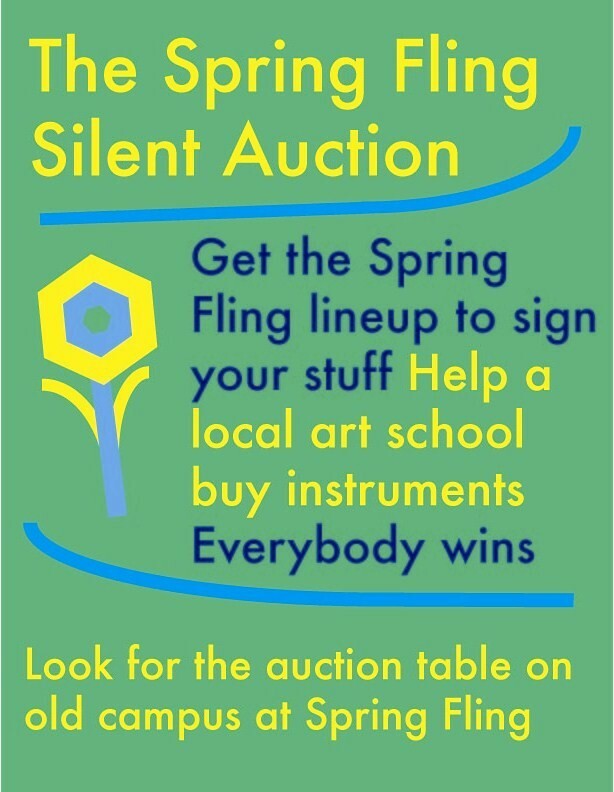 If you’ve ever wanted a signed poster or other memorabilia from Pharrell, Colin Meloy, Gregg Michael “Girl Talk” Gillis, or the rest of the Spring Fling lineup, this is your once-in-a-lifetime opportunity: YCC and Dwight Hall have teamed up to bring you a silent auction for a series of autographed items by the Spring Fling performers including Pharrell, The Decembrists, Girl Talk, and more! Look for the auctioning table at Spring Fling, which will be out from 12:00 PM onwards. Simply walk over and drop your bid in the box. All proceeds will go to buying much-needed instruments for Co-Op high school, a new school designed for aspiring young artists in New Haven. That is all. Have a nice day. Months are usually composed of weeks but this month is especially composed of weeks. National Public Health Week, Muslim Awareness Week, Week of Service...this week is Semana Chicana, which will be focusing on the theme of education for immmigrants and DREAM Act. In addition, it is Earth Week. Enjoy your natural surroundings most of all, but check out the hikes, demonstrations, movies (Wall-E on Old Campus! ), and more if you can. 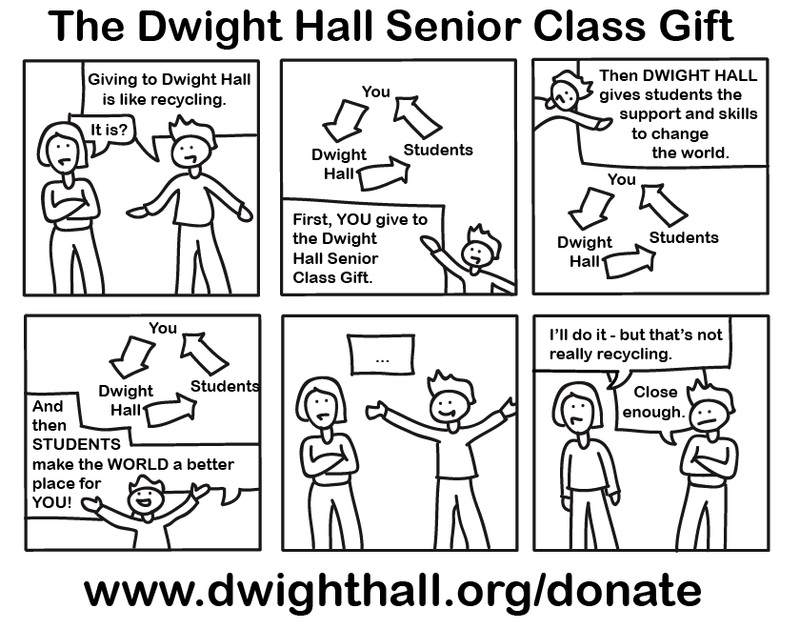 Many Dwight Hall programs can work in the community only because of your donations. Finally, if you're over here this summer, you have absolutely no excuse to not volunteer...so check out some of the summer volunteering opportnities at DESK and Teen-Senior Connect. Many of these programs are in severe need of volunteers when school goes out. ...and if you're anything like me, you'll be sort of (read: really) relieved when its all over. Elections for Ward 1 occurs on April 17th. YCC elections open sometime in the next few hours...please scroll down to see why Dwight Hall has endorsed Ryan Beauchamp for YCC president. Be sure to stay civically and college-ly engaged and whatnot. AIDS Brigades, an initiative dedicated to bringing AIDS awareness to foriegn countries is looking for workers and anyone interested in public health to build a new chapter from the ground up. This is an exciting opportunity for being involved in an organization from start to finish. National Student Partnerships, an organization dedicated to combatting homelessness through aiding people in finding employment and more is closing down due to lack of funding from the recent financial crisis. I've admired everyone who has volunteered in this organization, and it has done some excellent work in combatting chronic homelessness from the roots. Hello friends. Thanks for making the week of service a success. It was nice of you. Meanwhile, as national weeks of something get more and more prevalent, please take the time to drop by...this week is National Public Health Week and the lovely people at PHC have worked hard to bring you a full slate of events. For the graduate student population, we are hosting an grad student/Dwight Hall alumni reunion and recognition ceremony on April 13 from 5 to 6:30 PM in Dwight Hall. Light refreshments will be served...please stop by if you get the chance. As always, any suggestions or comments are greatly appreciated. Umbrellas are still on sale in Dwight Hall. Please email Peter Lu. Impress your friends. ...and much more. Please check out the full list below! Finally, check out Islamic Awareness Week below for a full list of events with both catered food and many learnings! Reinvigorated by Spring Break? So is Dwight Hall! Welcome, friends, to the new newsletter. This newsletter was automatically generated by the website at dwighthall.org...even better, from now on, you can add your own content to the website by clicking on the link above. If you are receiving this email, you have already registered. Simply click on log in, then "need password? ", and create your own password, then click on add event or add article under add content...everything you publish will be published on the website and this newsletter as well under the editor's oversight. This tool will eventually be open to all member groups, though we are still working on adjusting a few kinks (adding a table of contents, etc.). If you are interested in using this tool, please email me. In other news the Dwight Hall - YCC Week of Service will be occurring next week starting Saturday. 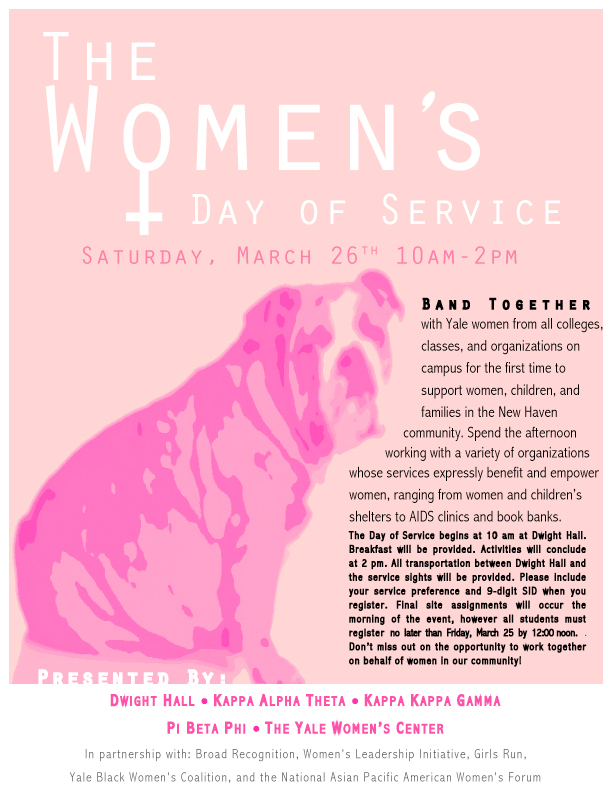 Be sure to check out all the events on the following website http://yalestation.yale.edu/weekofservice/. If you are planning to come to the Walk in the Park, a similar event will be held on Saturday, but the time and meeting place on Sunday will be 10:15 AM in front of the Yale bookstore. Finally, the semesterly mandatory Dwight Hall cabinet meeting for group leaders will be occurring tomorrow at Dwight Hall from 7:00 to 8:30!